One topic that comes up continuously is the simple but profoundly vital question: “How do I know if I am truly saved?” That’s kind of important, right? Imagine how debilitating it would be if you were not TOTALLY POSITIVE that you are saved, sealed, sanctified, and guaranteed everlasting life in Paradise NO MATTER WHAT you do in this life after you are born again. I assert that such doubt shrouding your heart would basically ruin your Christian life. And yet that is where far too many Christians are today, way down deep in their hearts. Although he seldom emphasizes Romans 10:9-10, the Moody professor answers this critical question by rightly stating that God promises that if one makes Jesus his Lord he is guaranteed salvation—and God doesn’t lie. And, he adds, if one is really saved, his life will evidence the fruit of the spirit. Not “necess-celery.” You and I know that it takes a split second to forever “be born again of incorruptible seed,” but after that you must be “transformed by the renewing of your mind.” There are countless Christians who have never “put on the mind of Christ,” and whose behavior is thus virtually indistinguishable from non-Christians. The difference is between one’s STANDING as a son of God and his STATE of fellowship with God. In this letter we will highlight some of the biblical truths about God’s rather astounding idea to make speaking in tonguesthe only indisputable proof to you that you are forever saved from sin and death and guaranteed a parking place in Paradise. 6I am astonished that you are so quickly deserting the one who called you to live in the grace of Christ and are turning to a different gospel— 7which is really no gospel at all. Evidently some people are throwing you into confusion and are trying to pervert the gospel of Christ. 8But even if we or an angel from heaven should preach a gospel other than the one we preached to you, let them be under God’s curse!9As we have already said, so now I say again: If anybody is preaching to you a gospel other than what you accepted, let them be under God’s curse! I’m always kind of tentative when I teach those verses, because they are so heavy. I do think they refer to non-Christians, but certainly there are many believers also teaching “other gospels.” I don’t even know what it means for a child of God to be “under His curse.” I do not believe it means he will lose his salvation, but let’s just say it’s not the best place to be. 12if we endure, we will also reign with him. If we disown him, he will also disown us;13if we are faithless, he remains faithful, for he cannot disown himself. WHAT DOES THAT SAY? It vividly clarifies that NOTHING we can do can cause the Lord Jesus to discard us from His Body like a piece of dandruff. Verse 11 says that because we died with him, we also arose with him, and thus are guaranteed everlasting life. Verse 12 says that if we faithfully stand with the Lord, we will receive great rewards for so doing. But if we turn away from him, he will deny us the rewards we could have had. Verse 13 says that even if we do turn away from the faith, Jesus is faithful to save us, because he cannot disown a part of His own Body. 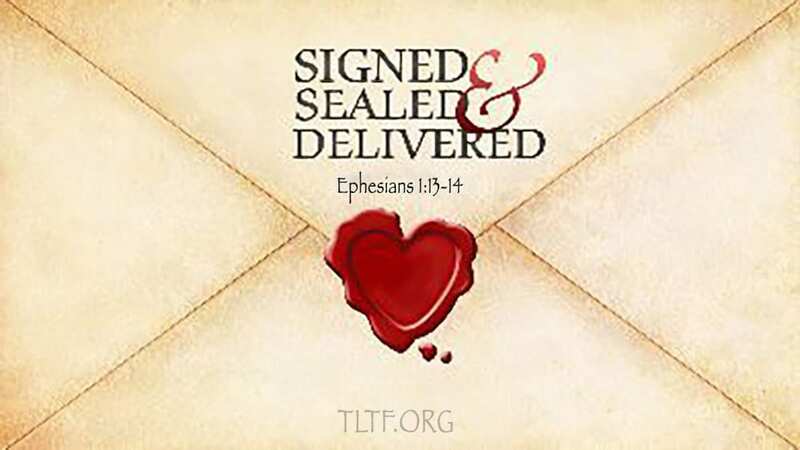 Each of us is signed, sealed, and delivered. PERIOD. By the way, the verses following that section warn against false teachers. “Are you saved, brother?” From what? Sin and death. The problem: death. The cure for death: life. Life starts with birth. Birth starts with SEED. Seed is seed. No one can get UN-born, no matter how he behaves. God forbid that your own child turn against you, curse you, and work against you, but even if he did, he is still your SEED. How much more certain is our “incorruptible seed”? If one believes the lie that his salvation is not forever secure, it cripples his spiritual walk. I can draw on my lifetime of basketball to amplify this point. When a coach tells a player that he will bench him if he makes a mistake, the player is hesitant to innovate, looks to pass rather than score, and is basically playing NOT TO LOSE rather than to WIN! I loved guarding guys like that. So does the Devil love “guarding” tentative believers uncertain of their everlasting destiny. Here’s what some former friends of mine, who should know better, wrote early this year to summarize the 100+ page paper they wrote about how a Christian can lose his salvation. From an intellectual perspective, I’d love to read and dissect the whole paper, but I have neither the time nor the energy nor the inclination to do so because it so blatantly contradicts the main point of Scripture written to Christians. In light of the theme of this FOD, I feel compelled to at least address their summary because I am aware that many dear brethren whom I know and love might buy into it, perish the thought. My comments are in [brackets]. Let’s take a quick look at the passage they cite in 1 John 2 (my emphasis is underlined). 18Dear children, this is the last hour; and as you have heard that the antichrist is coming, even now many antichrists have come. This is how we know it is the last hour. 19They went out from us,but they did not really belong to us. For if they had belonged to us, they would have remained with us; but their going showed that none of them belonged to us.20 But you have an anointingfrom the Holy One, and all of you know the truth. 21I do not write to you because you do not know the truth, but because you do know it and because no lie comes from the truth. 22Who is the liar? It is whoever denies that Jesus is the Christ. Such a person is the antichrist—denying the Father and the Son. 23No one who denies the Son has the Father; whoever acknowledges the Son has the Father also. The above two-paragraph summary is rife with self-contradictions, as well as biblical anomalies, and their conclusion is patently false. As the Bible writers did more than once (1 Tim. 1:20; 2 Tim. 1:15; 2:17; 4:10a; 4:14; 3 John 9), the authors and promoters of this grievously false doctrine should be called out by name in front of the church for teaching a devilish lie that is a slap in the face to both God and Christ. Thank God that one day He will bring to light the truth about each believer (1 Cor. 3:10-14; 4:5). Now, in closing, back to reality, and the heart of this letter. One of the greatest truths you and I have had the privilege of being taught is that SPEAKING IN TONGUES IS THE ONLY ABSOLUTE, INDISPUTABLE PROOF THAT YOU ARE SAVED. Without that glorious truth, there is always room for the Enemy to plant seeds of doubt about one’s salvation. Why? Because each of us still has that disgusting sin nature alive and un-well within us, and thus too often some of our thoughts, words, and deeds are far from Christian. This provides many opportunities for Satan to tell us, “No Christian would drive like that,” etc. Knowing the truth about the sin nature and the permanence of our salvation allows us to robustly renounce the Devil’s lie. On the Day of Pentecost, when the Ekklesia was born, God established the pattern He desired. Immediately after those brethren believed that Jesus is Lord, and that God raised him from the dead (the chief components of Peter’s “sermon” that day), they spoke in tongues. This pattern is reinforced in Acts 8, 9, 10, 19. Here are some other pertinent verses showing that speaking in tongues is God’s witness to us that we are His children forever. 15The spirit you received does not make you slaves, so that you live in fear again; rather, the spirit you received brought about your adoption to sonship, And by him we cry, “Abba, Father.” 16The spirit itself testifies [witnesses] with our spirit that we are God’s children. 17Now if we are children, then we are heirs—heirs of God and co-heirs with Christ, if indeed we share in his sufferings [live for him] in order that we may also share in his glory [rewards]. The witness of the spirit within us is speaking in tongues, which enables us to be witnesses to others (Acts 1:8) of His truth and love. Therefore I want you to know that no one who is speaking by the spirit of God [speaking in tongues] says, “Jesus be cursed,” and no one can say, “Jesus is Lord,” except by holy spirit. It is by obeying God and speaking in tongues as God exhorts us to do (1 Cor. 14:5) that each one of us knows for sure that we are forever saved. The one who keeps God’s commands (1 Cor. 14:5) lives in him, and he in them. And this is how we know that he lives in us: We know it by the spirit he gave us. Because we cannot see, hear, smell, taste, or touch the holy spirit, this must be referring to its manifestation, i.e., speaking in tongues. For more about speaking in tongues, see One Day With The Creator, Segments 18-21. And here is one more very enlightening passage of Scripture that has seldom been understood as referring to speaking in tongues. 6This is the one who came by water and blood—Jesus Christ. He did not come by water only, but by water and blood [his birth in the flesh]. And it is the spirit that testifies [witnesses], because the spirit is the truth. 7For there are three that testify [witness]: 8the spirit, the water and the blood; and the three are in agreement. 9We accept human testimony [witness], but God’s testimony [witness] is greater because it is the testimony [witness] of God, which he has given about his Son. 10Whoever believes in the Son of God accepts this testimony [witness]. Whoever does not believe God has made him out to be a liar, because they have not believed the testimony [witness] God has given about his Son. 11And this [witness/manifestation of the spirit/speaking in tongues] is the testimony [witness that] God has given us eternal life, and this life is in his Son. 12Whoever has the Son has life; whoever does not have the Son of God does not have life. 13I write these things to you who believe in the name of the Son of God so that you may know that you have eternal life.